Talking football: The plot thickens for Wigan Athletic! It’s often claimed that Easter is the crucial period of the season where everything – titles/promotion/relegation – gets decided. Well in the case of the League One promotion picture, it’s only made things even more blurred! It was advantage Latics on Good Friday, with Paul Cook’s men taking over at the top of the table thanks to Shrewsbury falling to defeat at Rochdale. But then, three days later, Cook saw his side crash at Portsmouth, allowing both the Shrews and Blackburn to leapfrog them in the table. This one’s going all the way to the wire! The ‘points in the bag’ posse will suggest Blackburn have the edge, on account of being top of the pile – albeit having played a game more. But Wigan’s game in hand – which they’ll play next Tuesday at Rochdale – will obviously prove decisive should the lads do the business at Spotland. At the end of the day, no matter what Rovers do, it’s in Wigan’s hands. If they win their remaining eight games, they win the title – simple as that. Shrewsbury are also still interested, but I can’t help but feel this weekend’s Checkatrade Trophy final at Wembley will take it out of them – mentally and physically. Look at Latics for proof of what can happen. The players and management made all the right noises in the weeks leading up to the Manchester City FA Cup tie that their focus beforehand was on the league. But they produced their two worst performances of the campaign against Southend and Blackpool. Max Power admitted after the City game that their minds clearly HAD been on the City game...which of course is more than understandable. How many times, he argued, were many of them going to be sharing a pitch with the likes of Silva, De Bruyne and Aguero? Latics also then struggled to get back in the swing after the City game, sneaking a 1-0 victory over rock-bottom Rochdale, before relying on a last-gasp equaliser to steal a 3-3 draw against a Scunthorpe side so out of form they sacked their manager the following week. 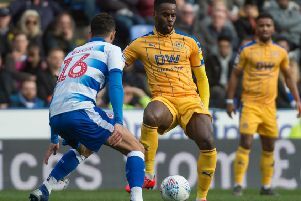 Leading into Wembley, Shrewsbury crashed 3-1 at Rochdale, before edging a 3-2 win over an Oxford side with absolutely nothing to play for – and whom Latics put seven past not so long ago. Fair play to them for doing that, but this weekend will be the highlight of many of the Shrewsbury players’ careers. A chance to play at Wembley. Don’t get me wrong, I hope Shrewsbury win the trophy this weekend. The way they’ve proved the experts – and me – wrong this season has been incredible. But a trip to Bradford next Thursday – on that pudding of a pitch – will be some come-down. Followed by a clash the following Tuesday against a Charlton side in red-hot form under Lee Bowyer and gunning for the play-offs. In the meantime, Latics play twice before the Shrews are back in league combat. Against two sides – MK Dons and Rochdale – in the bottom four. Six points wouldn’t half crank up the pressure on their rivals...not to mention lay down the gauntlet to Rovers as well. Congrats to the four Wiganers who made the League One Team of the Year this week. Nick Powell, Sam Morsy, Dan Burn and Nathan Byrne were all deserving of their place. The only grumble was whether it should have been more! Chey Dunkley was perhaps a bit unlucky to miss out, although Charlie Mulgrew of Blackburn had to get the nod given the fact he’s weighed in with an astonishing 12 goals and three assists from centre-back! Christian Walton would surely have been named between the sticks had it not been for the bizarre small print that barred loan players from consideration. Max Power simply didn’t play enough football in the first half of the season to warrant consideration, while Will Grigg was squeezed out by Jack Marriott with the fictional side playing only one recognised striker. It’s that time of the year when the Teams of the Year get selected, and the shortlist for Player of the Year announced. Given the season-long Powell/Dack debate, it was no surprise to see both make the three-man shortlist for League One player of the year, along with Peterborough’s Jack Marriott. While I think Powell is the best player in the division, Marriott struck me as being the best opposition player I saw facing Latics. And his 25 goals and five assists, in an inconsistent side, speaks for itself. Either would be a deserving winner.